먹황새는 이란, 아무르, 우수리, 중국 동북지방 북부, 한국, 일본, 아프리카, 인도 등에 분포한다. 먹황새는 몸길이가 96㎝이고, 머리와 목, 윗가슴과 등은 광택있는 검은색이며 배는 흰색, 부리와 다리, 눈주위는 붉은색이다. 어린 새는 전체적으로 흐린 색깔에 갈색 빛이 돌며 광택이 없다. 논이나 강가, 산악의 작은 골짜기에서 서식하며, 단독 또는 1쌍씩 행동한다. 인적이 드문 높은 나무 위나 바위 절벽에 작은 나뭇가지로 둥지를 틀고 3∼5개의 흰 알을 낳는다. 먹황새는 우리나라에서는 9∼10월과 1∼2월에 아주 드물게 나타나는 멸종 위기의 진귀한 겨울 철새이므로 천연기념물로 지정·보호하고 있다. 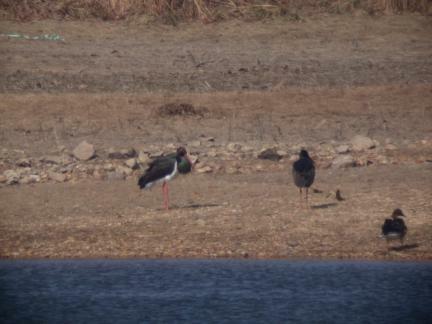 The distribution area of the black stork is as follows: Iran, Amure, Usuri, North of the northeastern districts in China, Korea, Japan, Africa, and India. 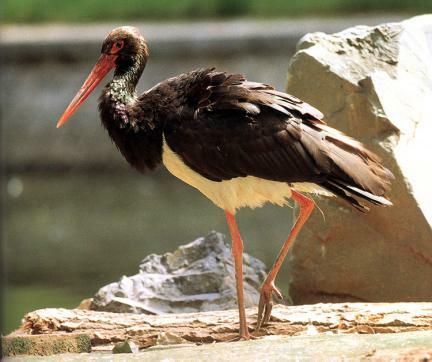 The body of the black stork is 96cm long, and its head and neck, upper chest, and back are glossy black. The belly is white, and the bill, legs, and sides of the eyes are red. The young bird has an overall blurred color mixed with brown. 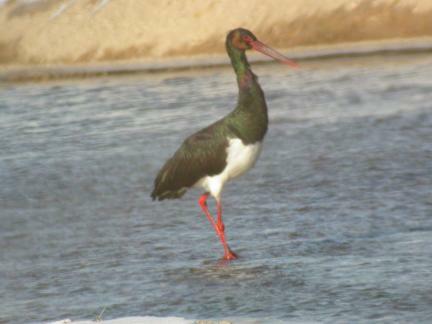 This bird lives in a rice field, the riverside, or a small valley, alone or as part of a couple. It builds a nest on top of a high tree or on the twig of a rock cliff and lays 3~5 white eggs. The black-headed stork is designated and conserved as a Natural Monument because it is a winter migrant that rarely comes out from September to October and from January to February in Korea.